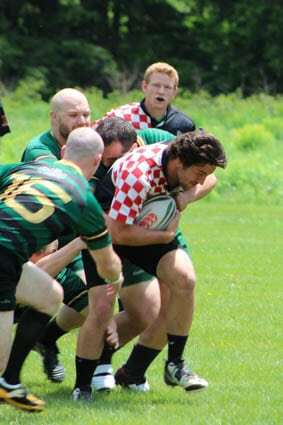 Saturday, June 13, marked the last away game of the spring season for the Rutland Roosters rugby team; they visited Black River Rugby Football Club of Ludlow, Vt. Without a referee assigned by the New England Rugby Referee Society, it fell to Sam Brown of Black River to referee the friendly game to the best of his ability. In the physical game that followed, numerous tries were scored by players on both sides. At the blow of the final whistle, the score stood at 21-17 in favor of the hosts. Despite the loss, Matt Manjuck was honored as the Rutland man of the match.